When Ladya Cheryl, a native Indonesian speaker, was assigned to go out into the city and talk to strangers in English, she was a little apprehensive. “I have problems with self-confidence, especially when I communicate in English, so it was very difficult for me at first,” Cheryl, a former English as a Second Language (ESL) student, recalls of an assignment for Tamara Kirson’s Listening-Speaking class. 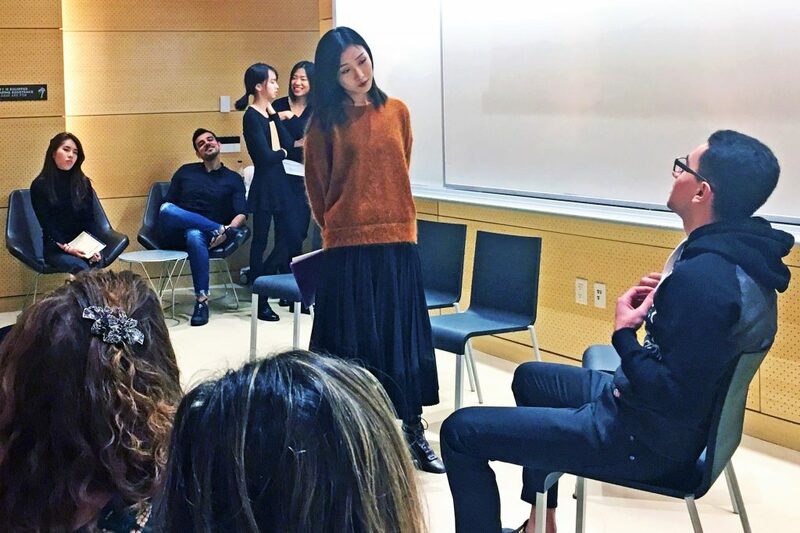 However, after tackling the assignment — designing a guide to farm-to-table restaurants and leading a video-recorded discussion on it with members of the New School and New York City communities — she felt empowered to speak up. “I’m glad I could finally overcome my fears,” says Cheryl, who has since enrolled as a film studies student. Cheryl is one of the many ESL students who have participated in Project-Based Learning (PBL) in The New School’s Intensive English Program. A reflection of the university’s collaborative, real-world educational approach, PBL gives ESL students the opportunity to practice their English language skills in the creation of multimedia explorations of culture, social customs, and more — an experience that builds up their confidence and breaks down their inhibitions. In the most recent series of PBL assignments, students in The New School’s ESL classes created a variety of projects — restaurant guides, podcasts, plays, magazines, music, and art pieces — exploring food studies, relationships, and literature. In Open Sesame, Cheryl and her classmates designed a guide to farm-to-table restaurants and led a video-recorded discussion on it with members of the New School community. The project not only helped Cheryl hone her English-language skills but also exposed her to the culinary community and culture. Other PBL video projects included The Game Gathering, in which students from Kirson’s Listening-Speaking class enlisted audience members to play food-inspired board games they designed, and Crossroads and Crosswords, in which students from the same class presented maquettes of food trucks they visited and invited audience members to try their hand at related crossword puzzles. The projects also encompassed podcasts, playwriting, and magazines. In their “R Wave FM” podcasts, high-intermediate students in Michelle Kaplan’s Listening-Speaking class researched and shared their views on human relationships, while students in Jessica Coyle’s advanced Listening-Speaking class wrote and performed a play, Untitled Symphony, in which they explored conflicts and conflict resolution. Students in Jessica Duke’s Listening-Speaking class created online magazines relating Alice in Wonderland to their lives, while students in Roshii Jolly’s Listening-Speaking class presented their designs for food trucks. PBL assignments differ greatly in medium and content. However, they all share requisite elements: focus on a question or problem, sustained inquiry, authenticity, student voice and choice, reflection, critique and revision, and a public product. What’s more, they all help prepare students for the next stage of their academic and professional careers.